Thank you so much to St Blanes Primary School in Glasgow. We came along and introduced Fearless drama to the whole school. What a fun day we had! So many creative pupils and they were so upfront or giving every activity a go! We can’t wait to come back in the future! Now that we have our Dalmuir classes running weekly, we gave Whitecrook Primary in Clydebank a visit! The pupils loved the drama activities and they did so well working together as a team - which we love to see! 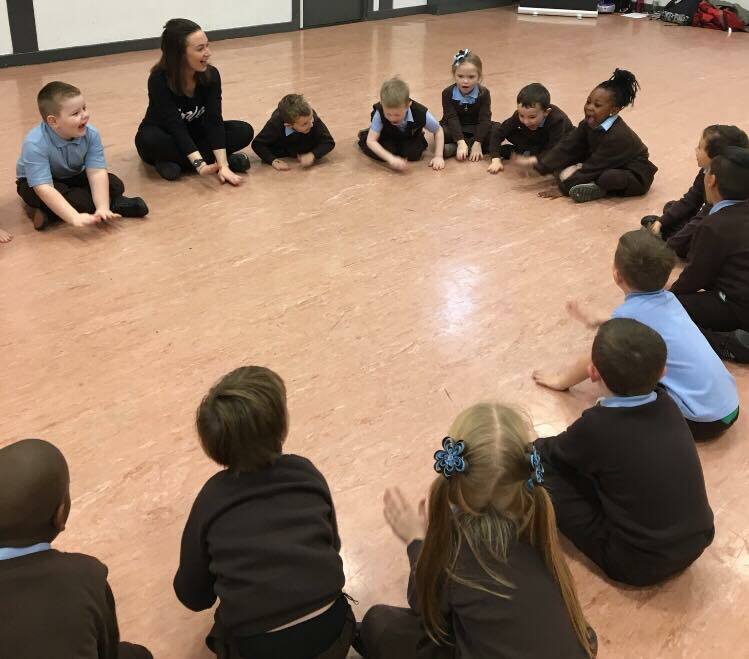 We loved how involved some of the teachers got, Drama is such an amazing tool for young children and so it was just amazing to see how well the children enjoyed it! Hopefully we will be back in the future! We had our summer BBQ after the last class before we broke up for the holidays - and it was DEEEEE-LISHH!! We were so excited so many kids & family members could make it for some grub & drinks! The sunshine came out for us which was a bonus - it was the perfect way to stop for the summer! North Kelvinside Sports Development came in for a chat with Eilish, during the summer holidays to see if we could link up and bring some drama into their programme! We were so excited they asked us to be part of their programme and look forward to working with them. 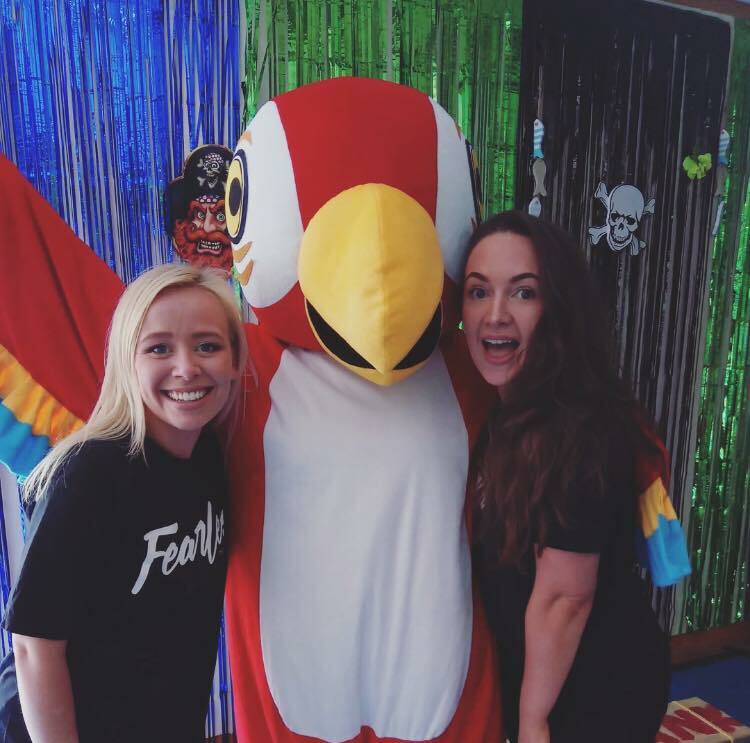 During the summer, Eilish & Jenny set up an area at Tesco Extra in Maryhill, during their Fun Day! This day was to raise money for Glasgow Children's Hospital Charity. It was a great event and we got to play lots of drama games with the children who were their with families! We will be back next year for sure! We were invited along to Clyde Shopping Centre during the summer holidays and got to hold some drama fun for the kids there! It was an amazing set up for children during the holidays and we would highly recommend it for any families next year during the holidays! We had lots of fun! 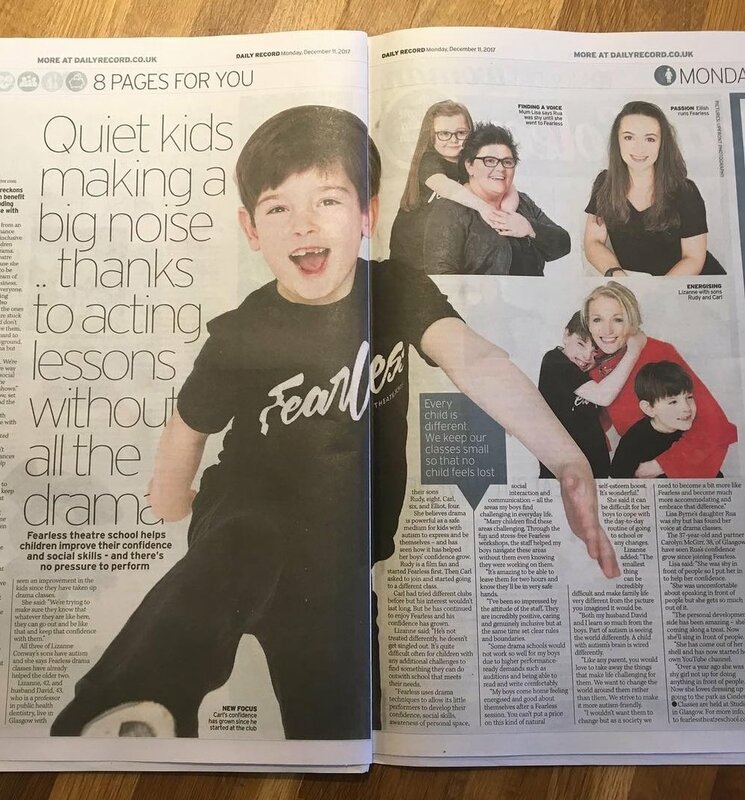 The Daily Record printed a two page feature on Fearless! Click the image below and read what some of our lovely parents had to say about Fearless! We give primary schools in the local area an opportunity to see what Fearless drama is all about. We do this by treating the pupils to taster sessions. If you think your school would enjoy these drama sessions then please get in touch and we can see what we can do. For now, have a look at where we have been so far! We were welcomed back to St Charles Primary School. We were welcomed by the primary ones and twos! The children gave it their all and were so enthusiastic to take part in every game and activity which is amazing to see! Thank you once again for having us St Charles! We are lucky to have visited St Charles Primary School a few times now. The children are very enthusiastic and a lot of fun during the drama sessions we have held there. in result, we had a lot of the pupils join Fearless after these tasters and we will be returning very soon thanks to the fantastic head teacher Elaine! 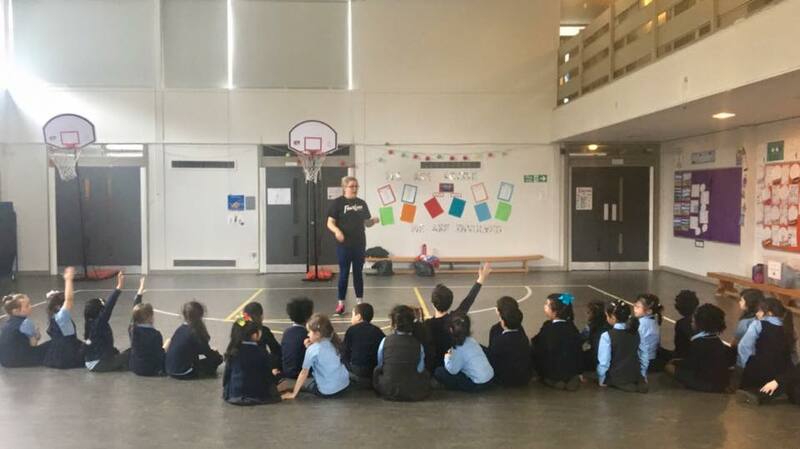 Not only were the pupils of Dunard Primary eager to jump into the drama fun, the teachers were also brilliant at showing enthusiasm towards it all, this was great to see! This is another school where some of our current Fearless kids are from so we look forward to coming back to Dunard Primary in the future and introducing our classes to new pupils! 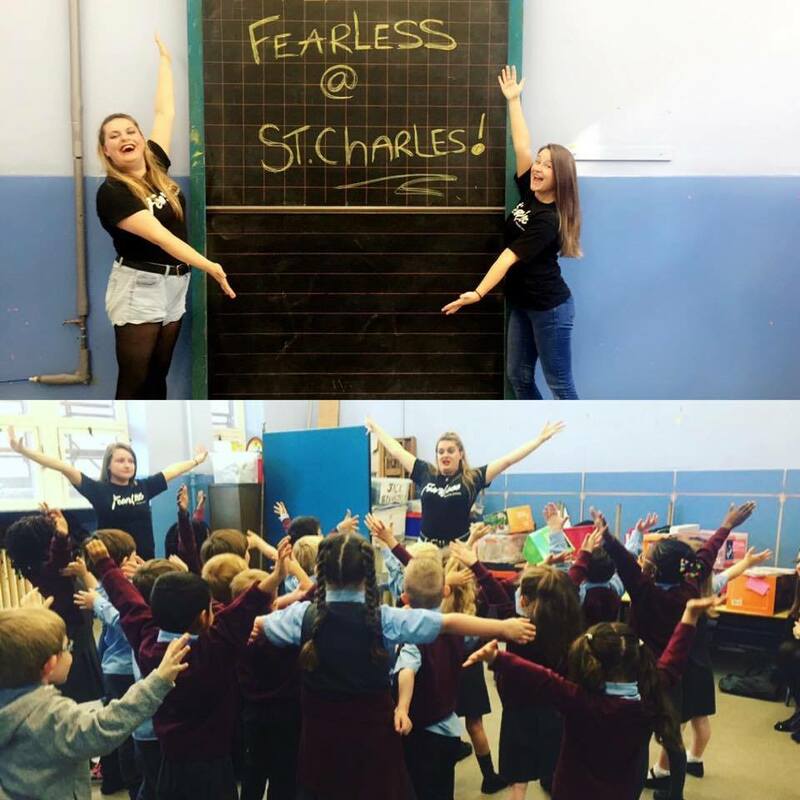 We were very excited to have the pupils of St Mungos take part in our Fearless drama sessions. The children were a lot of fun and gave it their all when it came to all of the activities! We had a fantastic time holding drama sessions at Our Lady of Loretto Primary School. The energy from the pupils and also the staff, was amazing and we were lucky enough to go back and help out with their end of year school show! The pupils were brilliant to work with and we look forward to visiting the school in the future!